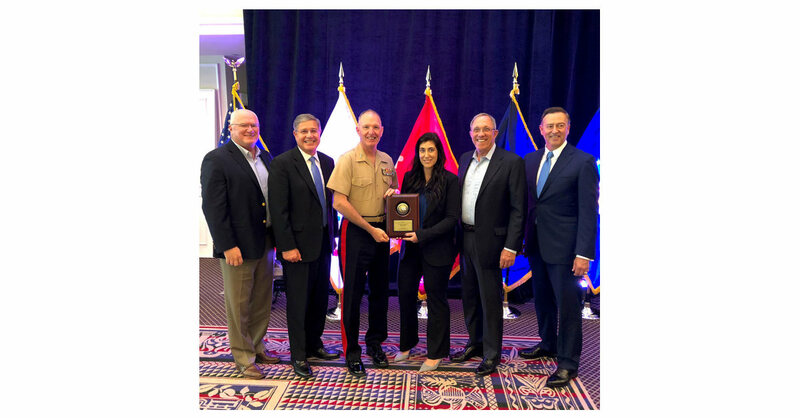 VIENNA, Va.–(BUSINESS WIRE)–Navy Federal Credit Union’s branch located on Camp Lemonnier in Djibouti, Africa, was named the Department of the Navy’s Distinguished Credit Union of the Year Tuesday during the Defense Credit Union Council’s (DCUC) Annual Conference in Williamsburg, Virginia. This is the 12th consecutive “Credit Union of The Year” award Navy Federal has received for one of its branches from the United States Navy. Navy Capt. Nancy S. Lacore, Commanding Officer of Camp Lemonnier, nominated the branch for the distinguished award. In her nomination package, Lacore pointed out that over 2,500 servicemembers were positively impacted by the education that Navy Federal provided throughout 2017. Navy Federal provided Blended Retirement System training, as well as other financial literacy education, to roughly 500 Marines that were temporarily placed at Camp Lemonnier. When the Personal Finance Management position with Fleet and Family was vacant in 2017, Navy Federal stepped up to make sure there were no gaps in financial education. Provided emergency loan services to servicemembers who were impacted by Hurricanes Irma, Harvey and Maria. About Navy Federal Credit Union: Established in 1933 with only seven members, Navy Federal now has the distinct honor of serving over 8 million members globally and is the world’s largest credit union. As a member-owned and not-for-profit organization, Navy Federal always puts the financial needs of its members first. Membership is open to all Department of Defense and Coast Guard Active Duty, veterans, civilian and contractor personnel, and their families. Dedicated to its mission of service, Navy Federal employs a workforce of over 17,000 and has a global network of 319 branches. For more information about Navy Federal Credit Union, visit navyfederal.org. Federally insured by NCUA. Equal Opportunity Employer.